Do you need comprehensive business phone services spanning multiple departments, locations, and roles? Are you hoping for a custom package of services to meet your organisation’s unique needs? Pioneer Business Phone Systems may have the solution. A telecommunications service provider, Pioneer Business Systems sells and installs equipment, establishes and maintains monthly services, and provides customer support. Also, the company offers service and manages installations throughout the United Kingdom. Here we’ll cover what Pioneer Business Phone Systems offers, how they compare with other local businesses, what their costs are, and whether their services are right for you. Plus, ExpertSure price comparisons can help you understand how the competition stacks up. Is Pioneer Business Systems Right for Your Business? In general, the company offers three sets of services. Firstly, they offer installation and management of a variety of phone systems and tools. Second, they provide business broadband for companies. Third, they supply products such as wallboards, business mobiles, and integrated video-enabled business phones. Imagine what it would be like to pick up the phone in your office hands-free, greeting your caller by video. So, consider the convenience of picking up an extra line when business starts moving quickly. Or what about recording phone calls to download and forward to another employee? Pioneer Business Systems provides this and more with their products. So let’s take a closer look. What Does Pioneer Business Phone Systems Offer? 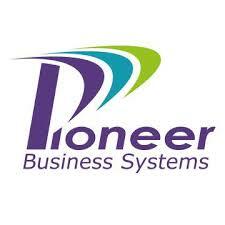 Pioneer Business Systems’ core offerings cover business phone systems including office phones, video systems, business broadband, wallboards, mobile devices for businesses, and non-geographic phone numbers. So, here’s more about the company’s offerings and critical benefits. Multiple phone systems options cover every business need. With the video-enabled business phone option HiHi, a touchscreen display makes it easier for you to navigate and see updates, calls, and contacts. Also, you can search for internal and external contacts, scroll through voicemails, and find what you need from a convenient home screen. Like today’s smartphones, HiHi comes with included software to help you meet business needs. Therefore, the company includes HiHi at little or no extra cost with your phone system package. Other office phone options cover handsets, cordless handsets, and headsets. Call reporting features to include campaign reporting, on hold messages, and call back reports that show missed calls for specific periods. Computer integration means real-time reports that show who your caller is, what products or services they’ve purchased before, and whether there are outstanding customer service tickets. Seeing this information in real time helps you deliver exceptional and up-to-date customer service for each unique caller. Other features like “presence,” which shows whether colleagues are available before you transfer a call, preventing customer frustration when they reach voicemail on a forwarded call. Plus, call recording allows service staff to download and forward recorded conversations to relevant parties. This way, you can save time rehashing conversations and skip to the crucial part of the call. Business broadband and business phone service are two of the package options Pioneer Business Systems offers. Business broadband has a range of high-speed options to suit your needs, and all packages include wireless routers. The company’s call centre in Bournemouth dispatches engineers across the UK so that you can schedule an appointment for installation. Billing is available through an online portal, making keeping up with your payments convenient. Custom tailor a package of business mobile phones for your staff from a selection of mobiles by Apple, Samsung, Blackberry, Huawei, and more. You can opt for a bundled service package or a pay-as-you-go plan, and you can divide the plans among staff according to department needs. Because the company spans all the UK, there’s always someone knowledgeable on hand to help out. The company explains that they don’t outsource support or maintenance personnel, meaning everyone is in-house and held to the same standards. How Does Pioneer Business Phone Systems Stack Up? These companies all offer VoIP communications, plus features like integrated voicemail, unlimited calling options, videophone systems, and more. With both monthly and pay-as-you-go plans for service, Pioneer Business Phone Systems are manageable for any size business. Use ExpertSure to compare pricing and help you narrow down your options. Consumers who partner with Pioneer Business Systems report via case study interviews that customer service has proved efficient and accessible. Staff is available throughout upgrade processes, order shipments, and everyday business. So, the organisation’s case studies include positive reviews from a variety of businesses, all with unique needs and customer bases. Overall, the efficiency and performance of the systems appear to impress customers. While many services are available as part of general business packages, there are some features which are add-ons or are only accessible with specific packages. For example, you can choose non-geographic phone numbers for your company, but this is an add-on that is not standard for any business phone service. Also, another consideration is the availability of the devices you want and the speed of internet you desire. Pioneer Business Systems creates custom packages to accommodate all types of businesses, from medical centres to jewellers. So, you can also use ExpertSure to compare pricing from Pioneer Business Phone Systems against costs with other companies. Finally, compare pricing for business phone systems with ExpertSure’s comparison tool, so you can decide what features and services work best for your company. Overall, Pioneer Business Systems offers comprehensive business packages to suit almost any size business and its consumer care needs.